Like the IRt/c, the pit viper has the ability to “see” infrared radiation. Pit vipers comprise a family of snakes that share a sophisticated thermal adaptation that stems from the evolution of specialized pit organs located near their eyes. These organs sense the infrared radiation of an approaching warm-blooded animal and send signals to the snake’s brain. These signals are used with the visual picture provided by the snake’s eyes, giving the snake more complete information about its environment. 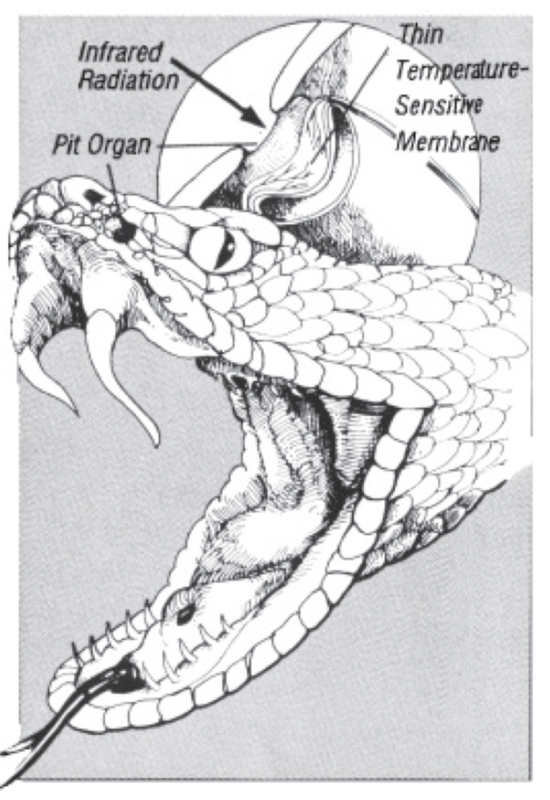 Pit organs are small facial cavities covered by a thin membrane of sensory cells that respond to temperature differences between the target and the snake’s body temperature. These sense organs are so sensitive they can resolve differences of just .003°C. Pit vipers can detect the presence of a warmblooded animal at distances of up to 50 centimeters in total darkness simply from the animal’s infrared radiation. The pit viper quickly and accurately scans the target with its infrared-sensing pit organs before deciding to strike to defend its nest or attack its prey.